Wilko are a perfect example of how adopting a consistent and coherent approach to marketing to students delivers great results. They understand perfectly what students value about Wilko and that has allowed them to become a firm student favourite. For students across campuses all over the UK, where there is a Wilko there’s definitely a way. BAM have loved playing a key role in Wilko’s approach to students over recent years and during Freshers 2017, we once again coordinated their tour taking on double the locations that we visited in 2016. Learning from 2016, we agreed to adopt the same approach but simply fine tune the campaign deliver even more effectively. Central to the campaign was the ever popular Wilko goody bag. BAM managed the central collation, unpacking, sorting, logistics and storage of over 150,000 items of stock. With the hard work of collating stock complete, building a data capture app, securing optimum fair spaces and recruiting top quality promotional staff for the job, made everything that bit the easier. During the tour BAM distributed 25,000 goody bags to lucky students, The goody bags contained some amazing samples including Original Source shower gel and Lip Balm. However students were most pleased to see the return of their favourite item…the Wilko wooden spoon. We know they are handy and useful for students, but we are not so sure why students go quite as crazy as they do for them, but who are we to question why. Each of the goody bags also contained a scratch card that gave students the opportunity to win a free sweet treat in store. 2618 students redeemed these treats from Wilko stores during the two weeks following the Freshers events. For those who weren’t quick enough to get their hands on a goody bag, we had the consolation of a second scratch card with the chance to win from a selection of Gift Cards. Over £8,500 worth of gift cards were awarded to students. Throughout the course of the campaign, over 40,000 students signed up to the Wilko mailing database. BAM have supported Wilko with their clear comms plan which ensure Wilko continue to connect with students throughout the year, developing an always on approach. Linked to the year round approach, we have also been supporting Wilko with continual activity throughout the year at two key cities. 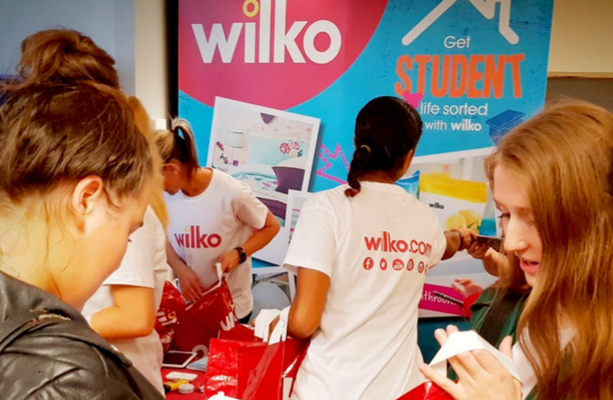 We have already started to see the positive impact of a consistent approach with Wilkos being cited as a key brand students remember seeing on campus. 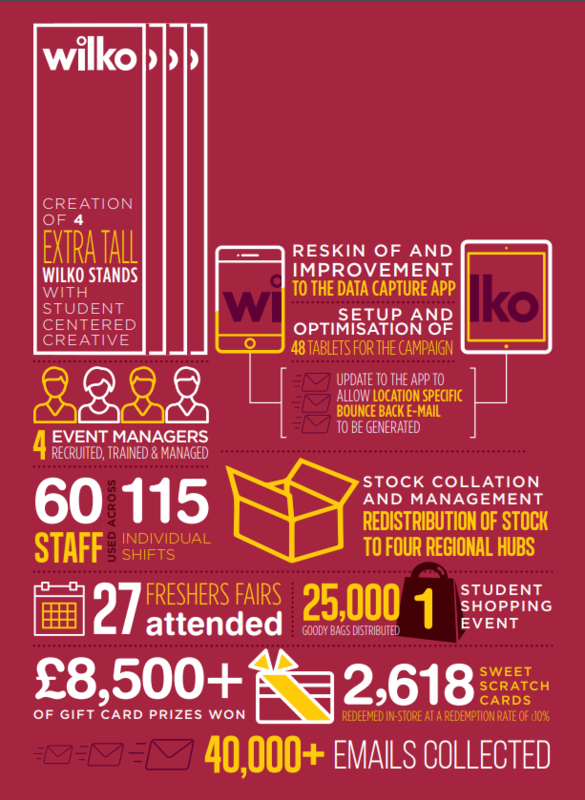 With the planning process well under way for 2018 we looked forward to supporting Wilkos and their continue to grow their brand love in the student market.